The Railway Story, a Brief History. From the late 18th century coal and iron was taken from the workings in the valleys by pack-mules to the various canals for transportation to the docks. By the early 19th century more collieries in the form of coal levels were opening out in the top end of the valleys and the use of trams and tramlines became popular. In 1821 Messrs J. & C. Bailey of the Nantyglo Iron Works, had opened their own tram road from Nantyglo to Abergavenny. On Saturday 15th December 1821 the Cambrian newspaper reported the occasion. It was stated the tram road that was opened on the Thursday 6th December 1821 had been completed in just seven months. On the day of its opening a line of trams were loaded with 26 tons of coal, one lump weighing 34 cwt and with 40 tons of bar-iron moved off preceded by a party in trams fitted up for the occasion with a band of music. At Abergavenny the bells rang all day and hundreds of inhabitants greeted the procession. It was said that all of the coal was distributed to the poor. The dignitaries gathered and had dinner at the Greyhound Inn, Abergavenny. At some point tram roads were laid to all major towns and toll houses were built on the lines. These toll houses were manned and gated to prevent access along the route unless a toll was paid. The toll was paid by the coal or iron master to the individual or company that owned the stretch of line. Payments were based on the type of mineral being carried, weight and the fee was normally per ton per mile. At Abertillery there was a toll house on the line that ran to Blaina, this toll house was situated on the main tram road opposite what is now York Street, Abertillery. First Steam Powered Engines in the Valley. Prior to the introduction of the steam locomotives to haul coal in this valley by Mr Prothero and the Monmouthshire Canal Company the Monmouthshire Merlin newspaper reported that the iron works at Coalbrookvale, Nantyglo had made arrangements to start producing tram plates. It was announced they had produced nearly 1,000 tons of the plates in the preceding month. In the same related news report it stated Messrs Brown of the Blaina Iron Works had nearly completed a locomotive for their own use. Shortly after, advertisements were printed in newspaper for the sale of iron tramlines to order. In July 1830 the Monmouthshire Merlin newspaper reported that Mr Protheroe of Newport had introduced locomotive engines on the lines of tram road belonging to the Monmouthshire Canal Company, for hauling coal from his collieries to his wharf at Pillgwenlly near Newport. Mr Protheroe applied to Messrs Price & Co at Neath Abbey to make the engine. The engine had to be designed to haul on inclines with various falls of between 3″ to 8″ inches in a chain (a chain is equal to 66′ feet). Mr Homfray of Tredegar had been using locomotive engines since 1829-30 constructed on the plan of Stephenson’s engines for conveying iron along the Sirhowy tram road and it was perceived that the great defect in those engines was the want of a regular supply of steam to keep them going and also the prevention of a boiler explosion by improperly charging the boiler. Messrs Price & Co had succeeded in overcoming those problems and delivered the locomotive to the wharf on Friday 16th July 1830. On Tuesday 20th July twenty tram wagons weighing 15 tons were attached to the locomotive at it drew it at four-miles per hour with ease, at Mr Protheroe’s colliery at Blancyffin Isha (Blaencuffin Isha) near Llanhilleth, the tram wagons were filled with coal and taken to the wharf, the journey, there and back which took 12 hours was completed with the same ease as with the empty wagons, it was said that the trip was impeded for up to 3 hours by teams of horse-drawn wagons and other obstacles on the way. On Friday 23rd July 1930 the locomotive performed the same work in the same time and on that occasion attended by Mr Hall; Mr Homfray; Mr Frere; Mr Summers Harford; Mr Charles Harford; Mr Llewellin; Mr Joel Lean; Mr Brown and Mr Cook, the principal Clerk to the Monmouthshire Canal Co. There was great interest shown in the experiment and the substitution of locomotive power for horse power would save in the expense of hauling to the amount of fifty per-cent. It was stated that to accomplish the same task performed by the engine in one day, would require the labour of six horses two days. Shortly after advertisements were printed in newspaper for the sale of iron tramlines to order. The Newport and Nantyglo Railway. 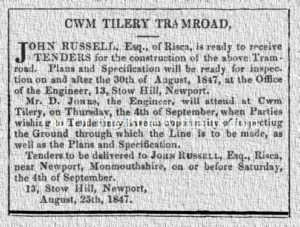 In October 1842 the new Newport to Nantyglo Railway project began under the name of the Newport and Nantyglo Railway Co. Iron and coal masters along with mineral proprietors called meetings to gauge the feeling of such a project before setting into motion this new undertaking. It was well received and it was necessary in order to be prepared for soliciting a bill in the next session of parliament that they gave notice, get surveys made and to lodge various plans and documents with the clerk of peace for the county on or before the 30th November 1842. The surveyors and engineers acted swiftly and succeeded in doing all that was required by the standing-orders of the two Houses of Parliament to enable the gentlemen to apply for an Act of Incorporation in the ensuing session. The engineers of the project were Mr John Hodgkinson and Mr Thomas E. Marsh – Hodgkinson & Marsh and the surveyor was Mr Morris. In January 1843 the Monmouthshire Merlin newspaper reported on a public meeting to debate the new Newport to Nantyglo Railway project. The idea of such an undertaking, a railway track linking both places via Pontypool was that of Mr James Brown of the Cwm Celyn Iron Works, Blaina and promoted by Mr Reginald James Blewitt, later founder of the Llanhilleth Collieries. The public meeting was held in the Great Room of the Town Council House, Newport, Monmouthshire and presided over by the Mayor of Newport. The coal, iron masters and mineral proprietors had recently been through a tough few years with very little or no profit and had wanted to see what improvements and savings they could make in getting their wares to Newport. One of their grievances was that of poor railway communication, it was stated, a district dependent on mineral sales, was said that the last census showed a population of 134,000 – exporting annually about 170,000 tons of iron and 700,000 tons of coal with the power of increasing the latter to over several million of tons yearly, yet such a district exposed to the active competition of neighbouring ports, with the very worst transportation links and the dearest means of transit in the United Kingdom. Iron transported down the existing Monmouthshire Canal Company’s canals was 2d. 1/2d. (two and a half-pence) per ton per mile. The new Newport and Nantyglo Railway Company would limit the fee to a maximum 1d. 1/2d (one and a half-pence) per ton per mile. It was stated that the present tram road up to Nantyglo was built on dangerous terrain and a journey along its route was a very perilous one. Hence arose the project of the Newport and Nantyglo Railway. The Newport and Nantyglo Railway Route. Messrs Hodgkinson & Marsh with the Surveyor Mr Morris prepared plans for the projected route of the proposed new railway line from Newport to Nantyglo as follows – Commencing from Jack’s Pill between the New Ship Dock and the River Usk, Newport to Cardiff Road to a Passenger Station at Stow Hill, to High Cross, Cross Llanbro, Pantyr Eos, Cocky-North and to Mr Hanson’s Incline Plane. To Green Meadowfrom Cwmbran Colliery to Cwmbran and Pontymoile (at which places the Brecon Canal could be easily attained). To Pontypool and Pontnewydd Iron Rolling Mills to a junction which would lead to Pentwyn, Abersychan and Golynos Iron Works. The main line would pass up Cwm Nant Duu, pass several Coal Mines and through the Llanhilleth Mountain by a tunnel 2,420 yards long, (this tunnel would pass through a valuable vein of coal for some considerable distance, the sale of which would partly off-set costs) to the Aberystruth Valley and up to the Coal Works at Cwmtillery, through the mountain at that point and into the Cwm Celyn and Blaina Iron Works at Blaina with a short branch line into Coalbrookvale Works, back terminating at the Nantyglo Iron Works. The total length of line from commencement to end was said to have been 21 miles and 23 chains with an outlay for a single line at £240,000 together with locomotive engines and other rolling stock a total cost of £275,000. Mr R. J. Blewitt then issued a “Prospectus with Shares in the Company”, a deposit of £5 on each £50 share to be paid into one of the following banks or their respective branches – Messrs Bailey & Co of the Monmouthshire and Glamorgan Bank. Messrs Bromage and Snead of the West of England Bank. Ballie and Co, Stuckey’s, The National and Provincial Bank and others. All applications for shares had to be sent to – The Provincial Committee of the Newport and Nantyglo Railway Company, Newport, Monmouthshire. By order of the provincial committee Mr R. J. Blewitt, chairman. Newport, January 12th 1843. From this date on, no other mention of this project was ever recorded or reported. It seems that the expense and costs put the individuals and companies off from investing in such an undertaking even though they had the backing of several influential gentlemen including Mr John Conway of the then Pontrhydrun Works, later Abertillery Tin Works. Messrs Harford. Mr Wood of the British Iron Works, Abersychan. Mr John Morgan of the Pentwyn Iron Works. Mr Martin Morrison. Messrs Allies, Messrs Cruttwell and Mr Thomas Brown of Cwmtillery Colliery, Tyr Nicholas. Mr John Russell’s Tramroad Cwmtillery. In 1847 Mr John Russell Esq of Risca purchased Tyr Nicholas Colliery, the Cwmtillery Colliery from Mr Thomas Brown. 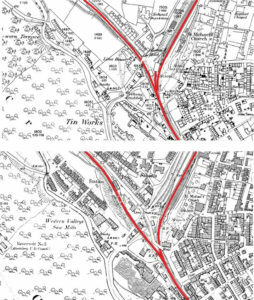 He improved on the colliery and invited tenders to construct a tram line (as seen left) from his colliery to the main line at the Abertillery junction with the main tram road from Blaina. The Railway Platform and Postal Office Abertillery. By 1848 the Abertillery Tin Works were established by Messrs Conway and Pearce on the grounds of the old iron works once owned by Mr Matthew Walker (where Tesco is today). It was announced that there was a station platform and post office facilities close to the main tram road incorporating the Pond House, Abertillery. Station Master at Abertillery, Mr Frederic Morgan Woodcock. The first recorded station master at Abertillery was Mr Frederick Morgan Woodcock, born 1815 at Morton, Hereford was station master at Abertillery. He lived with his wife Bessie or Betsy Woodcock nee Tutton of Portswood, Hampshire and family. The Monmouthshire Railway and Canal Company. In 1849 the main tram road network had spread throughout the valleys, the Monmouthshire Canal Company was renamed the Monmouthshire Railway and Canal Company and they set about converting all major tram roads into railways. This would take a considerable length of time and was expected to be completed in about six-years. The Experimental Trips of Wagons and Engines. In 1849 the Monmouthshire Railway and Canal Company conducted experimental trips on their tram line from Newport to Coalbrookvale, Nantyglo. the experimental trips were overseen by Captain Simmons, of the Commissioners of Railways, conducted to enquire into a report upon the differences that existed between the canal company and the freighters to test wagons to be deployed on the company’s railway from the following August. The first train consisted of twenty ordinary coal trams belonging to Mr John Russell and drawn by a team of five horses, the property of and driven by Mr Hodges of Church House. Next followed two model trains, one built under the superintendence of Messrs Nicholas Wood of Newcastle-upon-Tyne and Thomas Bouch, resident engineer and Manager of the Edinburgh and Northern Railway and formerly of the Stockton and Darlington Railway. The other wagon was designed and built by Messrs Fox Henderson & Co Birmingham. Both wagons were built specifically for use on the tram road. Lastly followed nine new wagons built by Messrs Smith & Willey of Liverpool for the Abercarn Colliery Co, pulled by five horses property of and driven by Mr John Phillips of Risca. It was reported that the horses were distressed and three wagons had to be dropped off, leaving six. At Newbridge the party was met by Mr James Brown who organised and paid for a meal for the entire party at the Newbridge Inn, later Mr Brown brought into requisition two of the Ebbw Vale Co locomotive engines with which the party started off to Ebbw Vale, the journey of nine miles took forty-six minutes. Back at Crumlin Mr Morrison provided forty trams of coal to which was attached the Abbey locomotive engine of which weighed thirteen tons and driven by Mr John Thomas. 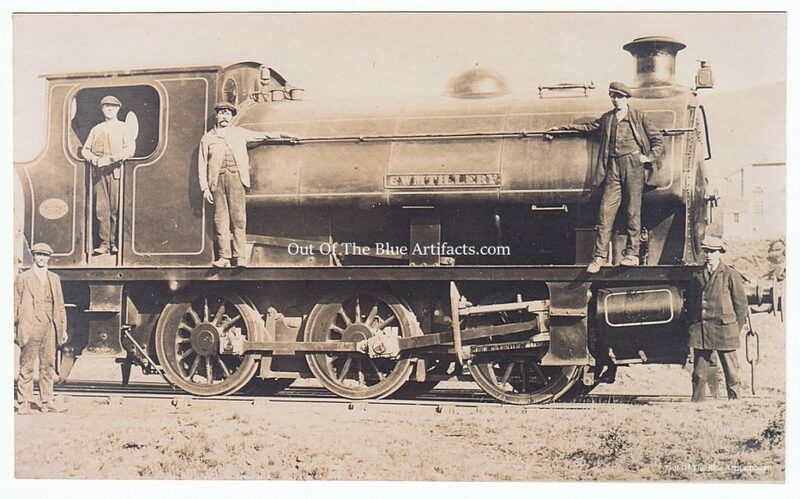 The Abbey locomotive was accompanied by Capt Simmons, Mr H. Coulson, engineer to the company and Mr S. Homfray Esq. Mr James Brown sat at the engine with Mr Thomas. The engine was limited to four miles per hour though it was seen that it could exceed this as to the amount of weight and at Sir Benjamin Hall’s road and the junction with the canal co, fifteen additional trams were attached, provided by Mr Latch. There were now fifty-five wagons attached, excluding the engine and tender and the train and party set off for Risca and at George Street, Newport the load was carefully weighed at 179 tons. More tests followed throughout the week with the examination of Mr S. Homfray on behalf of the Sirhowy Tramroad Co and the Tredegar Iron Company. The Rhymney Iron Co, the Ebbw Vale, Sirhowy and Victoria Iron Co and the Cwmcelyn & Blaina Iron Works represented by Mr James Brown Esq and Risca works under Mr John Russell. Capt Simmons expressed his desire to test the engines on the longer route from Newport to Nantyglo. The Thursday morning at 9.00am Capt Simmons had the Abbey locomotive and the Ebbw Vale locomotive coupled together at the Court-y-Bella weighing machine and attached 124 coal trams a total weight of 115 tons. The train of wagons were said to have been 350 yards in length. Capt Simmons started the train journey at 10.27am. The first four miles were accomplished in 24 minutes 10 secs. After stoppages at Risca to take on water and to detach wagons for Wain Fawr Colliery the train headed for Crumlin stopping for water and lunch for the party. The section from Union Foundry at Llanhilleth to Abertillery Tin Works took 23 minutes 14 secs. The train then steamed off to Coalbrookvale, Nantyglo where Capt Simmons thanked Mr James Brown for his assistance and left for London via Abergavenny. The Main Tram road Conversion. The conversion of the main tram road network to railway which began in 1849 was said to have been almost complete by the mid 1850’s. The railway network as with the previous tram road system in the north of Aberystruth did not connect Blaina with Brynmawr. Messrs J. and C. Bailey had transported their iron to Brynmawr and sent it down the old tram road to the Brecon canal. The part of non-extinct railway between Nantyglo and Brynmawr was known as the missing-link. Smaller branch tram roads were still to be converted. Mr Thomas Cardy, Haulier of Abertillery. In 1856 Mr Cardy, the landlord of the Oddfellows Arms, Abertillery was a haulier operating on the Cwmtillery valley tramlines. His premises was at the Cwmtillery Valley junction on the Newport to Nantyglo Tram Road (where the Abertillery Fire Station is today). Mr Cardy was haulier and contractor for Messrs T.P. & D. Price the coal masters and owners of the Penybont Tillery Colliery and the Tillery Levels in that valley. All coal from the collieries and supplies to them were hauled to and from by Mr Thomas Cardy. He had a large stock of work horses in his stables at the Oddfellows Arms. In April 1856 Mr Cardy advertised his whole live stock for sale, they comprised of fourteen horses between 15 and 17 hands high. Mr Cardy stated he was selling his hauling business in consequence of Messrs T.P. & D. Price and Co employing steam locomotive power. The Take Over of the Cwmtillery Tramroad and a Station for Nantyglo. In 1858 the Monmouthshire Canal Company entered into negotiations with Messrs Bailey for a lease of their railway from Coalbrookvale to Nantyglo where they want to erect a station for passengers and goods. It was also stated the company had negotiated with Mr John Russell for possession (on equitable terms) of his Cwmtillery Branch Line of about a mile in length, recently constructed by Mr Russell under the supervision of the company’s engineer. The Opening of the Merthyr, Tredegar and Abergavenny Railway. In June 1862 Messrs Greene and King, contractors announced Brynmawr was connected with Abergavenny by rail. The contractors had run an engine up the line and most of the stations were completed. In September 1862 the line was officially opened, street parties were organised and luncheon was held at the Griffin Hotel, Brynmawr attended by Mr Crawshay Bailey Esq, M.P. The New Station at Abertillery. 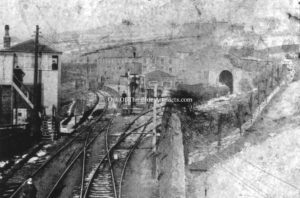 In 1865 the new railway station at Abertillery (as seen in the centre of the image right) was built, the new Abertillery Railway Station was constructed where the library is today, with large sidings a goods shed and crane for loading and unloading, just behind. Later there were three level crossings in close proximity to the station, one at the bottom of the Bush Hill which crossed the railway to access the tin works, another called the Rhiw Park Level Crossing in the Cwmtillery valley under what is now the Foundry Bridge and another by the side of the Limes House, what was later known as Station Approach Crossing. In September 1868 the doubling of the railway lines from Aberbeeg to Abertillery started, it was this doubling of the lines that resulted in the Coach & Horses Inn Six Bells, Abertillery being demolished in 1871 and rebuilt at a new location where it is today. The Post Office Telegraph Service. In September 1870 the Post Office Telegraph Service was established at Abertillery. The Missing Link and Mr Crawshay Bailey. In 1869 Mr Crawshay Bailey started the construction of a rail link between Nantyglo and Brynmawr, it was stated this was just a mineral line though his works were sold in July 1871 to the Nantyglo and Blaina Company and the scheme was abandoned. In 1873 the doubling of the railway line from Abertillery to Blaina was proposed by the Monmouthshire Railway and Canal Company, though later reports suggest it never occurred at this point. Station Master at Abertillery, Mr William Mogford. The Post Office Directory of 1871 shows Mr William Mogford as the station master at Abertillery. Mr Mogford was born in 1828 at Stoodleigh, Devonshire. with his wife Maria Mogford. The 1871 census shows Mr and Mrs Mogford living at Station Masters House, Abertillery, close to Abertillery House, the Limes House. The Station House on Oak Street hadn’t been built at this time? Mr Thomas Chambers was station master at Blaina and Mr John Ferriday was station master at Brynmawr. In 1873 the Station House, Oak Street, Abertillery was built. On the 1871 census Mr Arthur Tilney was listed as station master Abertillery and was living with his wife Annie Tilney nee James at Llanhilleth. Mr Arthur Tilney born 1844 at Kirby Bedon, Norwich, Norfolk. He was however listed in the 1871 Post Office Directory as being the station master on the Western Valley Line at Crumlin. Upon his arrival at Abertillery he worked as a clerk for the Monmouthshire Railway Company and was said to have later finished with the company when they merged with the Great Western Company in 1880. The 1871 Post Office Directory lists Mr Arthur Tilney as one station master working the Western Valley Line at Llanhilleth as mentioned and Mr George Reeves the other station master at Llanhilleth, working the Great Western Line. In 1880 the Monmouthshire Railway and Canal Company merged with the Great Western Railway Company. In October 1884 the line from Abertillery to Blaina was eventually doubled. The Old Goods Yard at Abertillery. The main railway from Blaina, through Abertillery and into the Cwmtillery branch junction behind the Bush Inn was very busy with railway traffic. In the late 1880’s the goods yard was situated at the back of the Bush Hotel, where there was a permanent railway crane at the yard to load and unload goods. The town of Abertillery was separated by the Cwmtillery branch line and crossing from Blaenau Gwent to the town was a very dangerous practice. In February 1889 Mr S. N. Jones urged the Abertillery Local Board to consider the placing of a bridge over the railway by the iron foundry as quickly as possible, the increasing amount of railway traffic up through the Cwmtillery Valley was endangering the population who travelled over the Rhiw Park crossing. A man was placed on the crossing to monitor activity and throughout the day he observed over 1,000 people passing over the crossing into and from town and over the same time period he logged over 21 trains being shunted up and down the valley. This action paved the way for the eventual construction of the Foundry Bridge ten years later. The New Station and Re-routing of the Main Lines at Abertillery. 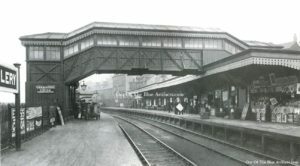 By the late 1880’s the population was growing further and railway traffic had drastically increased, a new passenger station was planned with a complete alteration in the route at Abertillery (as seen left). Originally the tram road and later railway was routed close to the Bush Inn, up to the front of the Station Hotel over a small level crossing over Station Approach, north of the Limes House and then onto Blaina, running parallel to what was later Oak Street. In July 1889 plans had been drawn up and tenders were invited for the construction of the major re-routing of the railway lines at Abertillery. During the alteration of the railway line in 1890 the line from Castle Street was diverted out from the Bush Inn over an embankment and bridge over Station Approach and behind the Limes House and then onto another embankment upon which the new Abertillery Station (as seen left) was built. 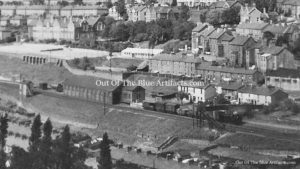 The goods yard was removed and was to be sited further up the lines between Abertillery and Blaina. The Great Western Railway Company that did the alterations employed Mr Noel Bagley, who did much of the ground work. Mr Bagley later lived at Oak Street and became a building contractor, he built the new Station Hotel, Bon Marche and the Cwmtillery Reservoir and was also responsible for other major building projects at Abertillery. The Completion of the Re-Route of the Railway Lines. In Novermber 1890 the work on the alteration and re-routing of the lines was completed and on Sunday 7th December 1890 the new Abertillery Station was used for the first time. The major re-route was completed in just 17 months and accomplished without any delays in rail traffic, passenger or mineral transportation. Station Master at Abertillery, Mr John Hill. In the late 1880’s Mr John Hill was station master. The New Goods Yard at the Kings Head. In 1895 a new goods yard was constructed on the main line close to the Kings Head public house, Abertillery (as seen right). The goods shed closed in the 1960’s. Station Master at Abertillery, Mr J. R. Leech. In the early 1890’s Mr J. R. Leech of Brynteg, Blaenau Gwent was station master. Mr Frank Walter Patey was booking clerk. Mr John R. Leech was born in 1855 at Market Dryton Shropshire, his wife was Mrs Jane Leech of Bridgenorth. Mr Leach’s eldest son Mr John Lester Leach entered the services of the Great Western Railway at Abertillery with his father and later became relief station master for the Monmouthshire section. Station Master at Abertillery, Mr Albert Webber. In the 1900’s Mr Albert Webber was station master. His wife was Mrs Mary Webber. Mr James Harry of Aberbeeg was acting station manager. The Nantyglo to Brynmawr Missing Link. As stated, the stretch of non-existent railway line between Nantyglo and Brynmawr had long been debated and the need for a rail link was wanted. After years of deliberation, in 1903 the companies concerned decided to venture into a joint undertaking and to link both places. On Monday 9th November 1903 the work of connecting the Great Western Railway Station at Nantyglo to the London and North Western Railway Station at Brynmawr, had been commenced, Messrs Jones & Sons of Neath were contracted to lay the estimated 2 mile length of railway for £45,000. On Wednesday 12th July 1905 the new rail link was officially opened in the presence of the Duke and Duchess of Beaufort. After the official greeting the Duke and Duchess boarded a special train made up of nine coaches and a saloon coach, driven by Mr John Baker of Abergavenny travelled to Nantyglo, there, after being received by Station Master Mr Goodern the train reversed back to Brynmawr on the return journey. Back at Brynmawr a luncheon was held at the Market Hall, Brynmawr. In August 1909 improvements were made to the station at Abertillery. Mr Albert Webber was still station master with Mr Charles Henry Evans was acting station master and Mr R. J. Trimble was the platform foreman. 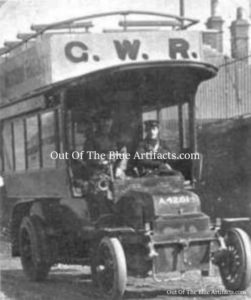 The Great Western Railway Bus Service. 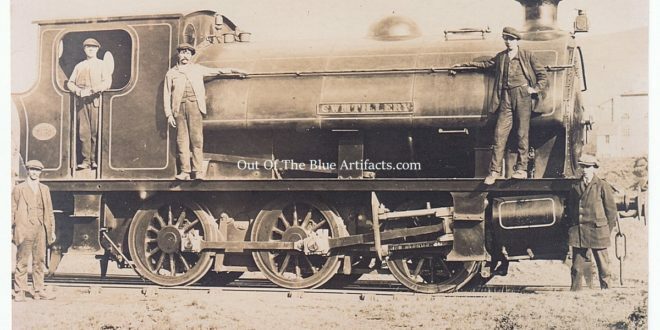 In the early 1900’s the Great Western Railway were running trains through all of the major towns and villages, though as the population expanded and more people resided away from the main lines there was a need for transportation to and from the stations and between smaller inaccessible villages that didn’t have a regular train service. The Great Western Railway Company supplied and ran a Motor Bus Service (similar to the one featured left) between such places throughout South Wales to augment the train services. In 1907 the Abertillery District Council demanded that the G.W.R. run a route through the valley from Brynmawr to Aberbeeg negotiations lasted years and in February 1911 an application was made by the G.W.R. for a petrol and carbide storage depot at Abertillery. It was later stated buses were being run and such a route was from Abertillery Railway Station to Penybont, Cwmtillery and back through Blaentillery, to town and Six Bells (to connect Six Bells with Abertillery), Aberbeeg and back, a regular service, at 5d. per journey. This motor service helped the people of Six Bells and Cwmtillery were there were no passenger stations. The G.W.R. Motor Service didn’t last long, as in 1912 as another planned route from Aberbeeg to Crumlin was abandoned by the G.W.R. as the road from Llanhilleth to Crumlin was too narrow for the buses and the excessive charges on other routes were putting people off from using the service. Also at this time the Electric Railless Traction Scheme, a major project planned to be run by the Western Valleys (Monmouthshire) Railless Traction Company, a proposed trolley bus service between Newport and Brynmawr via Abertillery which would render the G.W.R. Motor Service obsolete, though as the Great War loomed the scheme was abandoned and both projects were shelved. Following is a Link to – The Railless Traction Trolley Bus Service. On December 31st 1920 Mr Harry Yendall retired after 50 years service to the Monmouthshire and Great Western Railway Company. Mr Yendall had been the ticket collector at Abertillery. Station Master at Abertillery, Mr John Davies. In August 1924 Mr Albert Webber left his post as station master and Mr John Davies, station master of Blaina took over at Abertillery. On Monday 30th October 1933 the Bournville Halt was opened for all passenger and workmen’s trains. It was stated that the waiting rooms and platforms had been opened in 1915 for the workmen travelling to the South Griffin Collieries from Nantyglo and Brynmawr, though it had taken 18 years to get it officially recognised as a halt. Meanwhile the South Griffin Collieries closed in 1921 though the company continued to stop trains at the platforms a few times a day for the convenience of the residents. Since the early 1900’s a station at Six Bells, Abertillery was needed, what had been a small hamlet quickly became a thriving village with many coal levels, collieries and shops etc which drew many people to the area. The idea of a station had been brought up on many occasions and yet seemed to be abandoned, yet in the 1930’s the proposal was taken up and the Great Western Railway were willing to construct a railway halt on the main line between the Vivian Colliery and the Arael Griffin Colliery at Six Bells. after much disagreement between the company and the various land owners the building of the much needed railway halt went ahead. The Official Opening of the Six Bells Halt. 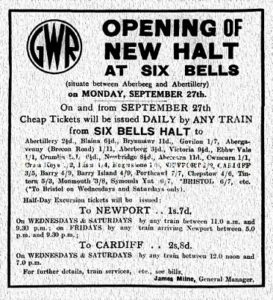 On Monday 27th September 1937 the Six Bells Halt was officially opened (as seen in the advertisement right). There didn’t seem to be any ceremony and the connection and opening installation went unreported. The railway halt at Six Bells was of the modern design and had the advantage of booking facilities and arrangements for the acceptance of parcel traffic. It had full passenger service with cheap travel facilities extended to other adjoining stations. The Demise of the Railway Network in the Valley. The Cwmtillery Branch lines had been removed in the 1950’s and 1960’s at a time when the Cwmtillery Colliery was restructed to enable coal to be transferred underground through to Rose Heyworth Colliery via the new drift, constructed in the late 1950’s. At this time the two collieries became known as Abertillery New Mine. All coal was later transported from Rose Heyworth Colliery and the railway lines to Cwmtillery were removed. The last passenger train from Abertillery was 10.39am on Sunday 29 April 1962. The railway lines from Blaina to Rose Heyworth were singled in the 1960’s and those from Rose Heyworth to Abertillery were reduced to just one in the early 1970’s though was still operational for the Rose Heyworth Colliery coal transportation. In late 1985 the coal production at Rose Heyworth Colliery ceased and the line was removed in readiness for the construction of the main road A467 that had been planned, prior to the closure of the colliery to run through the valley from Newport to Brynmawr. The stretch of road between Abertillery and Brynmawr used the route of the old railway line with a few deviations from the original railway foundations. Notes of Interest – Mr Reginald James Blewitt (Promoter of the Newport and Nantyglo Railway Company) was born in 1799, second son of Major Edward Blewitt of Llantarnum Abbey and the great-grandson of Sir Samuel Blewitt, Master of the Skinners Company and Sheriff of London in 1697. He was educated at Rugby School and practised to become a solicitor though retired in 1827, he kept his term at Lincoln’s Inn hoping to take to the bar at a later time. In 1829 he helped establish the “Monmouthshire Merlin” Newspaper with Mr Charles Hough though Mr Hough went bankrupt in 1831 and Mr Blewitt became the sole proprietor. Joseph Bailey Jnr and Messrs Joseph & Crawshay Bailey Esqs were political adversaries and Mr Joseph Bailey financially backed the “Beacon” Newspaper to publicly attack Mr Blewitt. In July 1837 Mr Blewitt was elected to the post of the M.P. for the Monmouthshire Boroughs taking over the post vacated by Sir Benjamin Hall. He defeated the Conservative Mr Crawshay Bailey in the elections by 172 votes to 117. In 1872 the Monmouthshire Merlin reported the the Llanhilleth Colliery had been sold to Mr Walter Powell, and that it had been previously been sunk many years ago by Mr Blewitt.